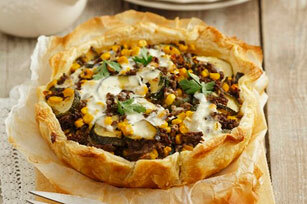 Here's a Mexican favourite with a Greek-inspired twist: taco-seasoned beef, zucchini and beans in a casserole layered with phyllo dough. Spray 9-inch round pan with cooking spray; line with 1 phyllo sheet, extending ends of phyllo over side of pan. Repeat with remaining phyllo sheets, crisscrossing layers to completely cover bottom and side of pan. Tuck ends of phyllo into pan. Bake 10 min. Meanwhile, brown meat with onions in large skillet. Stir in taco seasoning mix, corn, zucchini and garlic; cook on medium heat 3 min. or until zucchini is tender, stirring occasionally. Spread beans onto bottom of phyllo crust; sprinkle with cheese. Top with meat mixture. Bake 15 min. Serve topped with sour cream. Brown 1/2 lb./225 g extra-lean ground beef in medium skillet. Add 1/2 cup water and remaining taco seasoning mix; simmer on medium-low heat 10 min., stirring frequently. Use to fill taco shells as directed on package.